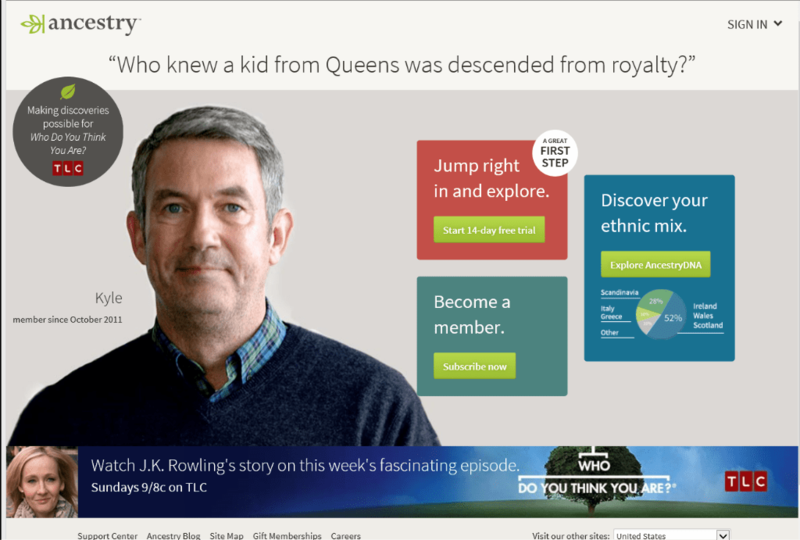 The home page of Ancestry.com, the genealogical website powerhouse. Tracing your family back for centuries can be prohibitively expensive, especially if you are needing to travel to distant locales to search for historical records. However, billions of records are now publicly available online and, fortunately, many of the companies providing access to your family’s legacy offer the data for free. Ancestry. This amazing site is the industry standard, offering over 14 billion records, four billion names, and 29,000 searchable collections. But here’s the kicker: this is a paid subscription site (and not cheap!). However, you can explore the world’s largest online family history resource for free with their 14-day trial subscription. You will need to enter credit card data but they won’t bill you until the tryout time ends (just be sure to cancel before your trial is up!). Monthly memberships providing access to all U.S. records are $19.99 per month. FamilySearch. This website offers free access to its enormous database, including the ability to research names, as well as extensive information such as articles, forums, online classes, and the Research Wiki. For over 100 years, the company has been preserving and sharing the largest collection of genealogical and historical records in the world. MyHeritage. Search through 5.5 billion documents from over 200 countries, build your family tree, play games with your kids to involve them, and connect with other researchers via this easy-to-navigate site. You will need to create an account but it is free. Mocavo This company is adamant about making content available for free, forever, via their basic product. Simply create an account and browse their extensive datasets. A paid product, called Mocavo Gold, charges for more extensive offerings such as discover alerts, the ability to back up your tree, or to save your research. Findmypast. A solid genealogy search engine that provides over 2 billion historical records from English-speaking countries around the world, including US censuses from as far back as 1790. They also have a great Irish records collection, millions of newspaper pages, and US military records. Unlike some sites, Findmypast doesn’t offer DNA testing or message boards but you can build a tree on the site. The USGenWeb Project. This non-commercial and free site is more a portal to other sites than a stopping point on its own. Groups of volunteers work together to maintain genealogy websites for every county and state in our country. Heading here will provide links to all the state sites which, in turn, provide gateways to counties. Available records include wills, surname registries, tombstone inscription listings, war records, census records, and photos. Find A Grave. Several grave and cemetery-related websites exist, but the volunteer-run ‘Find A Grave’ is the leader. Search millions of grave sites from around the world, find cemetery records, and other death-related information, all for free. Very likely you will find a photograph of your ancestor’s gravesite and possibly even a photograph of the person you are researching. RootsWeb. This is one of the Internet’s oldest genealogical communities. Though a bit overwhelming visually, it’s a free site, and useful due to its collaborative nature. Researchers are encouraged to connect with others via message boards or mailing lists, or even submit records for inclusion in its user-contributed databases. You can even build your own genealogy website on RootsWeb.com. Google. An indispensable tool in your arsenal of free places to search would definitely be Google. The services provided here, ranging from making surname queries on its general search engine to Google Books to Maps and Earth to translation tools, all provide the muscle to push your research significantly further. The Library of Congress—Chronicling America. Newspaper searches can be the portal to fascinating articles about an ancestor whether it’s an update on this years’ cotton crop or an obituary. Here you can search America’s historic newspapers published from 1690 to the present. Thanks Betsy! Let me know if any particular site here helps you.